When you talk about world changers, most people wouldn’t consider mattress companies near the top of the list of those doing good and making a difference in their communities. This isn’t without justification. If you look at the mattress industry over the last 25 years, it has consisted predominately of mega brands owned by the very rich that dominant and control the vast majority of the industry, product development, and pricing…in any case, giving back and helping those in need has never been something I have associated with the big traditional retail brands. This past year the mattress industry saw a huge shake up. A number of new start-up companies entered the industry and they are taking direct aim at Tempurpedic, Serta, Simmons, and the other big brands. Leesa, Tuft & Needle, and Yogabed are just a few of the new contenders to join the mattress fight this year. Beyond just creating a great product and offering great service, this new breed of online mattress company isn’t just sitting by on the sidelines of their communities. Many are getting directly involved by donating their time, resources, expertise, money, and mattresses to help those in need. Leesa’s one-for-ten program represents their foundation of giving. For every ten mattresses Leesa sells they donate one mattress to homeless shelters or others in need. As you can imagine, this translates into a substantial number of mattresses. 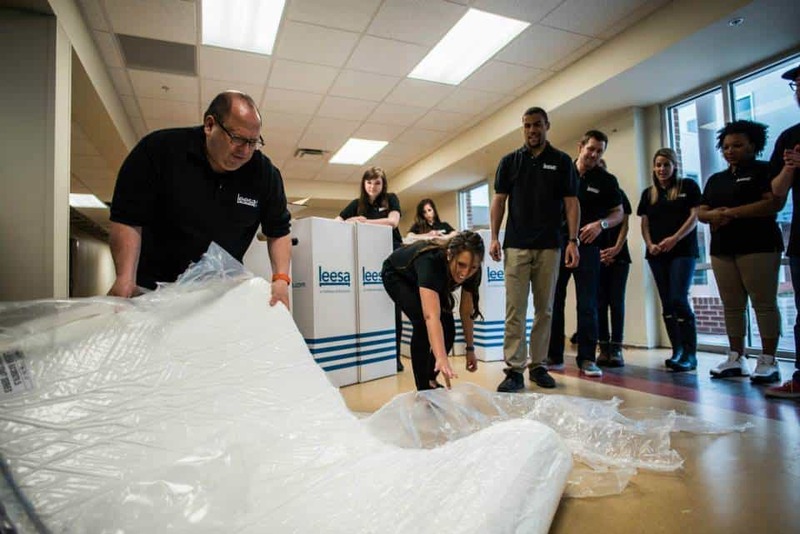 Leesa just hand-delivered their first batch of free mattress to the Union Mission in Norfolk, Virgina. 325 mattresses were specially designed and manufactured to meet the specific needs of the newly built shelter, which is opening in June. Leesa offers an impressive 100 day trial period and 100% money back refund policy. Beyond this being a great incentive for new customers to try Leesa it’s also a great way Leesa helps other communities around the US. If a customer decides the Leesa isn’t the right mattress for them Leesa will help to arrange for a donation center to come pick up the mattress. This helps ensure no mattress goes to waste. When it comes to giving Tuft & Needle takes a hands on approach. Based out of Phoenix, Arizona, Tuft & Needle is actively getting involved within the local community. Within the last 6 months Tuft & Needle has made two sizable donations. Moma’s House – Tuft & Needle donated and hand-delivered 21 new mattresses. Moma’s house helps female survivors of abuse rebuild their lives and recover from their past. Chrysalis – Tuft & Needle doubled their support and once again hand-delivered 40 new mattresses. The Chrysalis shelter helps women, men, and children who have been the victim of violence and abuse. Team Tuft & Needle after pulling the first few mattresses off the truck for the Chrysalis shelter. 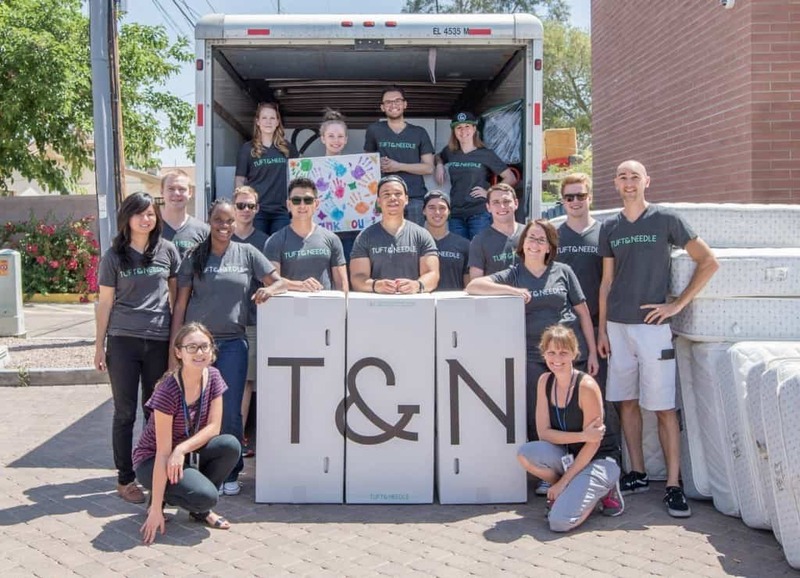 Tuft & Needle brought their entire Phoenix based team out to deliver the new mattresses and also helped remove and dispose of the old mattresses. As a Phoenix native myself it really brings a smile to my face to see a local company so actively involved in bettering the lives of those around them…but especially the lives of people that are sometimes forgotten or cast aside. Additionally, like Leesa, Tuft & Needle also donates or recycles returned mattresses to local communities around the US. Like Leesa and Tuft & Needle, Yogabed is actively using their company to improve and better lives from coast-to-coast. Yogabed has partnered with several shelters across the country and is planning to donate $50,000 worth of mattresses over the next 12 months. Additionally, a portion of every Yogabed sale goes to a fund that will be donated to cancer research. Within their first year of operation Yogabed hopes to contribute over $100,000 to charities and others in need. Giving back isn’t a marketing tactic for Yogabed. As a result, you won’t find much about Yogabed’s philanthropic programs on their website. They have made the decision to quietly make their mark and laser target their donations at selected charities where they know they will have the maximum impact. Just like Leesa and Tuft & Needle, Yogabed also helps give back by donating any returned mattresses to local charities. Hats of to Leesa, Tuft & Needle, and Yogabed. Keep up the good work!